This question has been asked here before. And I think I was the one who originally asked it. That isn't my car but it's a dead ringer for it. I've never been one of those guys who needed a "hot" car to impress the ladies. I don't gauge my self worth by what kind of car I drive like a lot of guys do. Matter of fact, some of the sh***iest beaters I've ever driven in my late teens and early 20's were my favorite cars. I think I've owned about 10 different cars since I was 16. I drive a 1980 Toyota pickup, known locally as a "bakkie" and it still goes well. Unfortunately, I may have to get rid of it soon as it is 27 years old after all, spares are hard to come by and I will be going to film school (yes, at my age) next year, so I do need a new car or at least a good 2nd hand one. I have pics of it but I unfortunately don't know how to post pics in my messages as yet. I believe it's absolutely vital that we know what other members drive, so I'm contributing this info to this post. I drive a Saturn SL 2002 White four door. No extras except a CD player. It's the workhorse in the household running all the errons. Bought in brand new in 2002 with nothing down and 0% interest at $250 month. Just made my final payment on it two months ago. 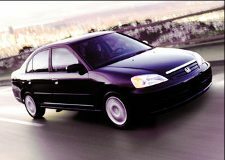 My wife drives a Honda Civic 2001 Midnight Blue with all power and a sun roof. She picked it due to it's reliability record. 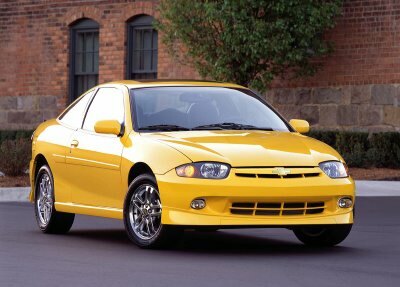 My daughter drives a Chevy Cavalier Coup 2002 "Kill Bill" Yellow is the color with all power and sun roof. We bought this one used two years ago. 2002 Ford Ranger pickup. Bought it a month after Sept. 11, when the auto companies were offering 0% loans -- figured it wasn't going to go much lower, and my old truck was an '87 Isuzu pickup with 178,000 miles on it. A 1996 Ford Fiesta, it's the 3rd Fiesta I've had since I've started driving and like Ash I've never really been into cars. Except that my car has four wheels. And it's maroon. And it's made by Toyota. Okay, I drive a 1998 Toyota RAV4. It's my own personal Hot Wheels car, and I plan to drive it until it won't go any further (hopefully another 20 or so years like Trevor's) or at least until gasoline is no longer available. And then maybe I'll mount it on a pedestal (or at least cinder blocks) in the front yard. We recently purchased a Honda Odyssey minivan. With our third child on the way, it was necessary. You cannot fit three carseats (we use Britax) in the back of an Accord. That would be our other main vehicle, a 2004 Honda Accord. I drive it to work, I come home, Katie drives it to work (and, yes, she does come home). Our third vehicle is my 1995 Ford F150, which is my general work truck when I need to move large items or tow something. I drive it to work once a week so that it is not just sitting and rusting. Mine: 1986 Ford Ranger, over 300,000 miles on it now. Wife's: 1994 Saturn 4 door, over 200,000 miles on it now. I've owned one new car in my life - 1983 Nissan Sentra. The payments were $114 per month. When I got it, it did not even have a radio, carpeting, etc. It was truly a bare-bones car. I think it had 150,000 miles or so on it when I sold it. A car to me is a vehicle, a means to get from point A to point B. It need say nothing about who I am or what I'm like. I treat my boats a little differently, though. Just yesterday, I had to go make a parking lot 'repair' to my wife's car. The shift linkage broke at the shifter. I few strips of trusty old duct tape and I got it home. I'll probably be making a run to the junkyard tomorrow. I actually bought my first ever new car, last year -- a 2006 Toyota Prius, green. Averaging 52 mpg on this tank (goes about 500 miles on one tank, typically). 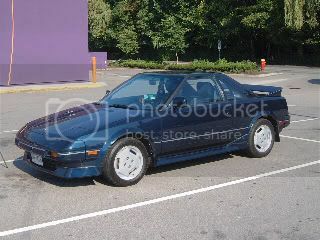 The little woman drives a 1987 Toyota MR2, nice little car, gets great gas mileage, runs real good. I think that Poogie is about as tall (6' or so) as will fit comfortably in this car, I'm 6'4" and to be comfortable in it I must pop the moon roof open. 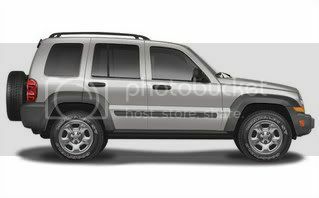 I drive a 2006 Jeep Liberty, use it for work and for vacations, also has a nice back seat for the beagles. This is only the 2nd. new car we've ever had. I have never bought a brand new car. I probably never will. They depreciate in value so fast, it just doesn't make for a good investment. I've always gone with used cars and gotten pretty good deals.